The Rested Life is an online Christian ministry that seeks to unveil Jesus and His love for us. We publish daily devotionals and provide platforms for visitors to submit their prayer requests and share their testimonies. 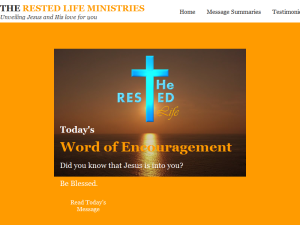 This what your The Rested Life Ministries Blog Ad will look like to visitors! Of course you will want to use keywords and ad targeting to get the most out of your ad campaign! So purchase an ad space today before there all gone! If you are the owner of The Rested Life Ministries, or someone who enjoys this blog why not upgrade it to a Featured Listing or Permanent Listing?